La Sagouine opens with a sweet old lady having a cup of tea and gossiping with you in her kitchen. Her tiny cabin kitchen is modest and her clothes old and more sturdy than fashionable, but otherwise it's much like having lunch with your grandmother: a catalogue of aches, pains, and who has died this year. And yet you can sense immediately that la Sagouine will be more entertaining, in her sweet, naive old way than your grandmother. Soon, gossip about her neighbours gives way to rollicking yarns about their shenanigans, and complaints about ailments to funny and touching ruminations on life, and what comes after. Written in 1971, La Sagouine was originally a series of sixteen monologues for radio. Acadienne novelist and playwright Antoine Maillet based the character, and her environs, on a real-life character in Maillet's native town of Bouctouche, New Brunswick. It was her friend Viola Léger who animated the role, and has performed it some two thousand times in French and English since 1971. Léger is certainly a fitting actress for the role; in addition to being an Officer of the Order of Canada, she herself was born to Acadian parents in Massachusetts—like her forefathers, in a foreign land and far from her ancestral home. In the Segal Centre's production, she performs select monologues, reflecting on worrisome things like death, confusing things like dealing with the Feds, and happy things like springtime and the war. Some of her musings show us a different perspective, like the War. It takes a crisis, la Sagouine muses, to remind people "that there are still some folks alive out here", and when there are no crises, they starve. Or how at Lent, la Sagouine and her siblings desperately wished to give something up so that they might have some fun like the other, richer kids. Other monologues echo sentiments with which we are more familiar. When the census-takers arrive, la Sagouine and her husband are unsure of how to report their nationality. They don't know what they are, just that they aren't Americans or French, and they don't speak English like the MacPhersons, so they can't be Canadian like them. Their struggle and inability to articulate their nationality echoes the ever-present Canadian anxieties surrounding Canadian culture and what it is to be Canadian. Perhaps the monologue that is most appropriate at most resonant with Montreal audiences, particularly at this time of year, is about springtime. We all know what it is to "freeze our feet from All Saint's Day to Easter", or rather, to wade through snowbanks from November to April. But thanks as much to Maillet's writing and Léger's exuberant, joyful performance as to a beautifully-conceived set and lighting design, you can almost feel the first soft breezes and warm sunbeams of springtime as la Sagouine takes simple pleasure in watching a flock of geese return, like the Acadians of yore and the Canadians of today, home once again. 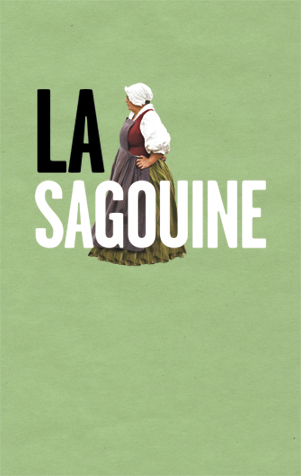 » La Sagouine at the Segal Centre for the Performing Arts. Directed by John Van Burek. Runs until April 10. $22 - $39. 514-739-7944. segalcentre.org.